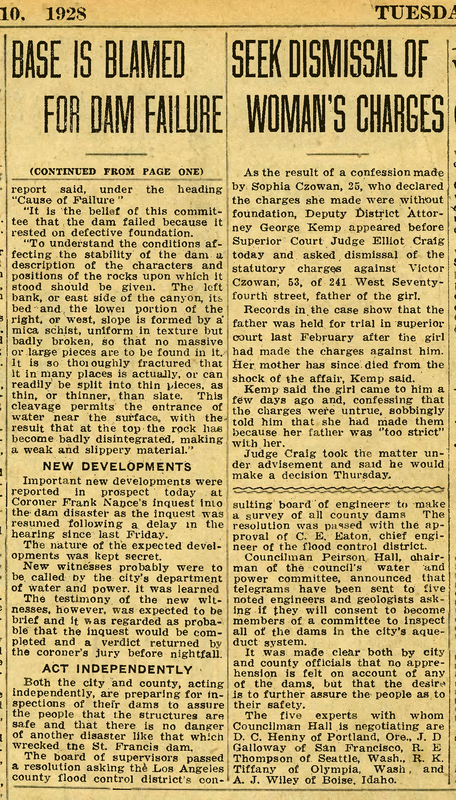 SCVHistory.com | St. Francis Dam | Los Angeles Evening Herald, 4-10-1928. Los Angeles, California | Tuesday, April 10, 1928. The St. Francis dam was a strong, well-built structure, but it failed because of a defective foundation, according to the official report made public today by the city council's committee of noted engineers which made a complete investigation of the dam failure. "1. The type and dimension of the dam were amply sufficient if based on suitable foundation. "2. The concrete of which the dam was built was of ample strength to resist the stresses to which it would normally be subjected. "3. The failure cannot be laid to movements of the earth's crusts. "5. This failure reflects in no way on the stability of a well designed gravity, dam, properly founded on suitable bedrock." After voluminously giving the history of the choice of site and the process of building of the St. Francis dam, giving full accounts of the engineering and geological tests carried out by the committee, the report said, under the heading "Cause of Failure." "It is the belief of this committee that the dam failed because it rested on defective foundation. "To understand the conditions affecting the stability of the dam a description of the characters and positions of the rocks upon which It stood should be given. The left bank, or east side of the canyon, its bed and the lower portion of the right, or west, slope is formed by a mica schist, uniform in texture but badly broken, so that no massive or large pieces are to be found in it. It is so thoroughly fractured that it in many places is actually, or can readily be split into thin pieces, as thin, or thinner, than slate. This cleavage permits the entrance of water near the surface, with the result that at the top the rock has become badly disintegrated, making a weak and slippery material." Important new developments were reported in prospect today at Coroner Frank Nance’s inquest into the dam disaster as the inquest was resumed following a delay in the hearing since last Friday. The nature of the expected developments was kept secret. New witnesses probably were to be called by the city's department of water and power it was learned. The testimony of the new witnesses, however, was expected to be brief and it as regarded as probable that the inquest would be completed and a verdict returned by the coroner's jury before nightfall. Both the city and county, acting independently, are preparing for inspections of their dams to assure the people that the structures are safe and that there is no danger of another disaster like that which wrecked, the St. Francis dam. The board of supervisors passed a resolution asking the Los Angeles county flood control district's consulting board of engineers to make a survey of all county dams. The resolution was passed with the approval of C. E. Eaton, chief engineer of the flood control district. 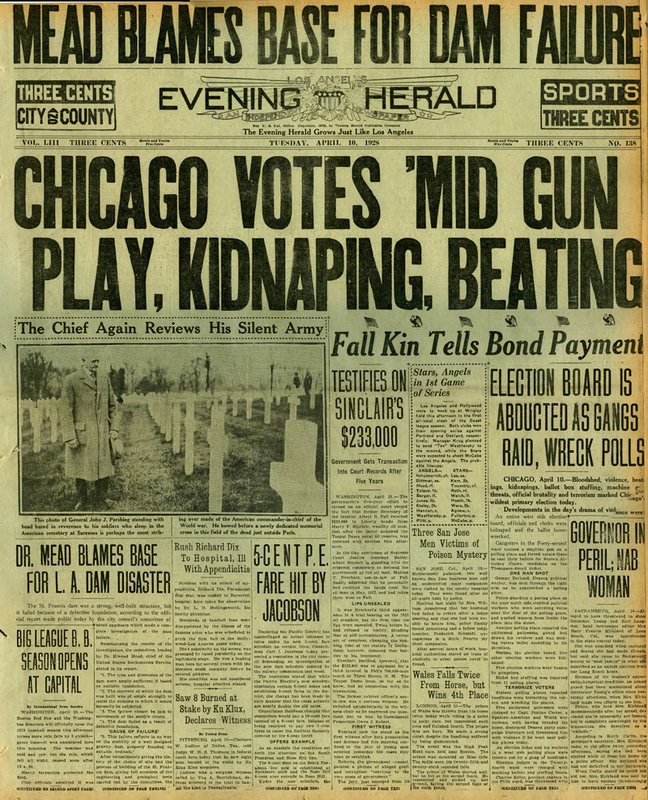 Councilman Peirson Hall, chairman of the council's water and power committee, announced that telegrams have been sent to five noted engineers and geologists asking if they will consent to become members of a committee to inspect all of the dams in the city's aqueduct system. It was made clear both by city and county officials that no apprehension is felt on account of any of the dams, but that the desire is to further assure the people as to their safety. The five experts with whom Councilman Hall is negotiating are D. C. Henny of Portland, Ore., J. D. Galloway of San Francisco, R. E. Thompson of Seattle, Wash., R. K. Tiffany of Olympia, Wash, and A. J. Wiley of Boise, Idaho.